When I see an app with “Ring” in the title, I usually think of one of two things: Lord of the Rings or Sonic the Hedgehog. Apparently I’m that much of a nerd. Unfortunately, Ring Runner has nothing to do with those fine bastions of geek culture, and instead takes its inspiration from those carnival games where you try to slide a metal ring down a curvy bit of wire, except if you touch the wire you get a little electric shock. Sound familiar at all? Even if you’ve never played the carnival game, the general concept of Ring Runner is easy to pick up. At the risk of sounding like an echo, you want to get the ring all the way to the end of the wire. When you come to a bend in the wire, you must use the two directional buttons in the left corner to rotate the ring, while dragging it along the curves. The ring is also constantly moving to the right, so you can’t think about it too long, but go too fast and you’ll likely get zapped. Touching the wire costs you a life, and while it doesn’t set you back all the way to the end, but will usually cost you a little progress and a lot of sanity. Along the wire are various power-ups to boost your score or do things like give you a larger ring, but even with help, this game is very difficult, a curious combination of slow pace and near constant anxiety. Each level requires a steady hand, excellent timing, and an enormous amount of patience to complete successfully. The controls work about how they’re supposed to, but it felt awkward trying to constantly balance between rotating the ring and dragging it. The game does look great, though, with clear graphics and colorful, interesting backgrounds, although consider yourself lucky if you manage to unlock more than a few areas. The soundtrack also wasn’t too bad, although it was mostly just ambient noise in the background, which is good for a game that requires so much intense concentration. For a game that progresses at such a sedate pace, I was surprised at how stressful it was. It’s not hard to get the concept, but actually mastering it is very challenging, and it left me feeling frustrated and unsatisfied more often than not. Those who like diving into a tough challenge headfirst might appreciate the relative difficulty of Ring Runner, but despite the cutesy icon and simple concept, this is definitely not a game I would recommend to the average casual gamer. 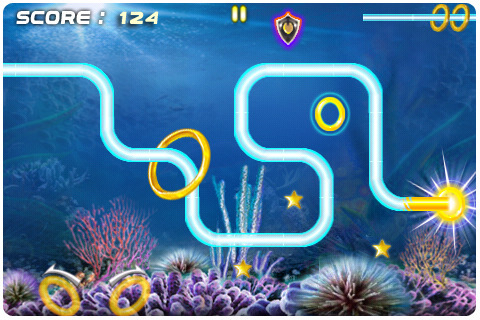 AppSafari review of Ring Runner was written by Tracy Yonemoto on May 30th, 2010 and categorized under Action, App Store, Games, Platformer. Page viewed 3302 times, 3 so far today. Need help on using these apps? Please read the Help Page.